LatinCloud Review 2019: Is LatinCloud a Good Hosting? LatinCloud offers cloud-based shared hosting services with free SSL certificates and tons of storage. They’re one of the few cloud-based hosting providers in Latin America, so if high reliability and stability are important to you, LatinCloud should be on your shortlist. 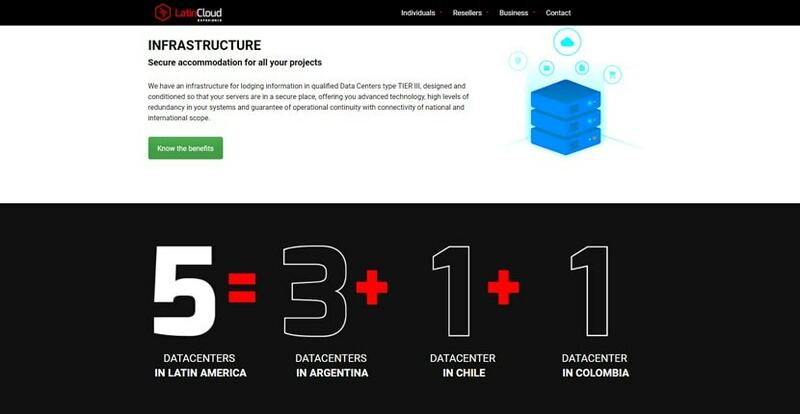 LatinCloud, formerly NXnet Hosting, has over 15 years of experience in website hosting and are dedicated to providing cloud-based hosting solutions for the Latin American region. Their shared hosting services are suitable for many personal and some e-commerce websites such as basic webstores, but they lack a lot of advanced features. Stay away from their website builder as it will increase your monthly hosting charges significantly. LatinCloud offers cloud-based personal hosting, corporate hosting, and WordPress hosting services. They’ve also got cloud-based VPS and dedicated servers on offer should users outgrow their shared servers. I like the amount of storage offered for all plans, and I really like that you get both Cloudflare CDN and free SSL certificates whether you’re on their business hosting plans or their regular cloud shared hosting plans. I’d like to see more advanced features with their regular shared hosting, but for most personal and smaller business websites, such as basic webstores, it should be fine. The lack of MySQL databases on their Starter plan is a bummer, though — it means users won’t even be able to install WordPress. If you’re an individual or small business going with this vendor, you’re better off going with their Advanced plan at minimum. LatinCloud offers a website builder, but at a cost. It provides over 200 templates along with the ability to create an online store with online payment processing. Otherwise, you can use cPanel or Plesk to manage your website. They do not offer an auto-installer. LatinCloud offers cloud hosting for both Linux and Windows. Their Linux hosting has two primary plans. Their Starter plan comes with 20GB of storage, 40GB of bandwidth and unlimited email. However, as previously mentioned, you cannot use MySQL databases with the Starter plan. For just a little bit more per month, you can choose their Advanced plan with MySQL database support, unlimited storage, bandwidth, email, and email marketing functionality. Both plans are much cheaper than what you’ll find with other providers, and you get six months of free hosting with the purchase of an annual plan. However, their Starter plan only offers quarterly billing. The difference in price is so minor that there’s no reason not to go with their Advanced plan. If you need Windows hosting, you only get one choice. Their Windows Site plan comes with 50GB of storage, 200GB of bandwidth, and MSSQL database support. Pricing for their Windows hosting is better than the average Windows hosting plan. If you want dedicated WordPress hosting, they offer a WordPress optimized platform, but the fee is almost double the price of the Advanced plan. LatinCloud offers excellent support with 24/7 telephone, live chat, and ticketing support. They also have an above-average knowledge base that includes instructional videos on how to use their products and even how to build your website using WordPress. LatinCloud is a decent provider if you have a personal website or a small webstore, but larger websites with more complex code will probably want to look elsewhere. It’s also not ideal for beginners unless you’re willing to pay up to use their website builder. Check out LatinCloud’s web hosting options today! Wondering how LatinCloud stacks up against other Web Hosting companies? Enter any other Web Hosting company and we will give you a side-by-side comparison.